for the sake of getting through time. and enable others to profit by it also. Thank you to all you diamonds who have enriched me. This entry was posted in Uncategorized and tagged books, fineartfriday, quotes, reading by alivingpencil. Bookmark the permalink. 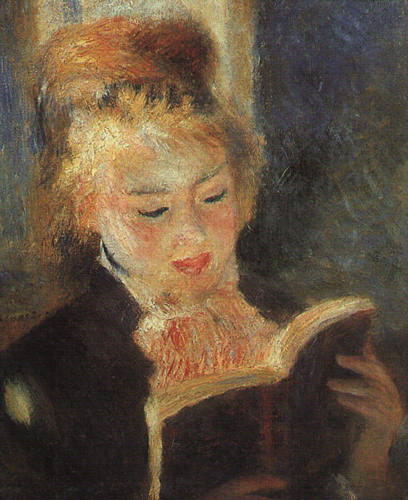 You know what I love about Renoir? (totally ignoring your comments, sorry) He knew the fine art of never drawing/painting any defining edges! I think this is just amazing, seeing as how you can tell exactly what the painting is of, and there’s a definite feeling conveyed by it. Beautiful!Sadly, I have been a sand-glass and sometimes strain-bag for several of the books I’ve been required to read at school this quarter. BUT that was all they were worthy of, so I don’t really feel bad about them. I would really like to read more mogul-diamond-worthy books, to be truthful! Oooh! I enjoyed reading up on the “Mogul” diamond, since we just finished the Middle Ages. Not to contradict the great STC, but the Mogul diamond didn’t seem to have profited others as much as it might have, had it been better cut… TY for the spontaneous history lesson! I’m actually preparing for 2 speaking engagements in which the Coleridge thoughts will fit very nicely. It is a challenge to be a mogul diamond because our culture so strongly encourages superficial reading. Flitting from thought to thought never allows the incubation period necessary for a great idea to develop. And if that idea never hatches, the ability to pass it on to the next person is negated. These are some great things to chew on this snowy February morning. Thanks, Carol!